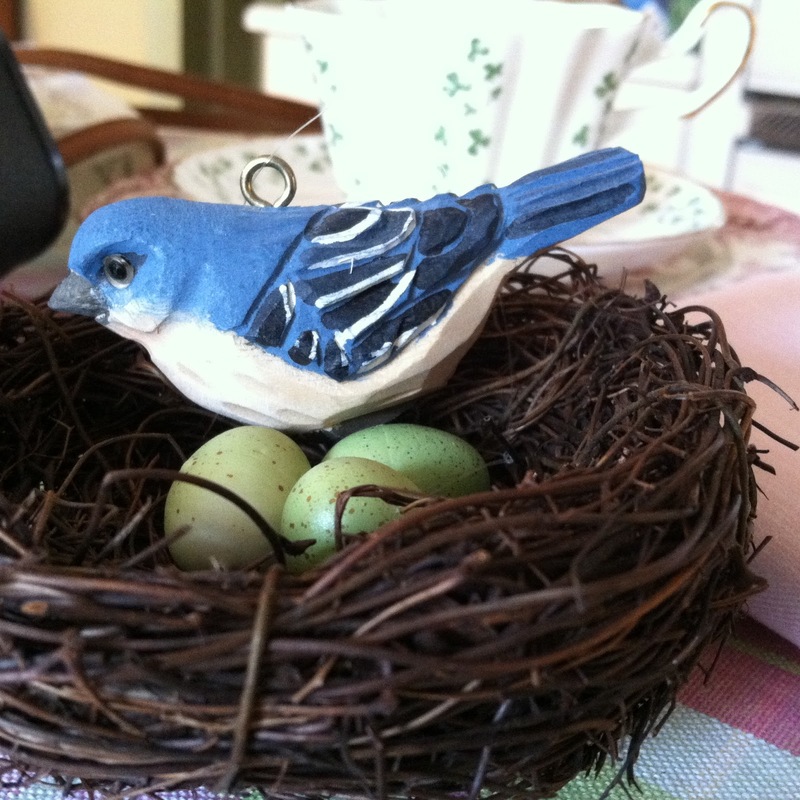 Sandi at Rose Chintz Cottage is having a bird tea today. 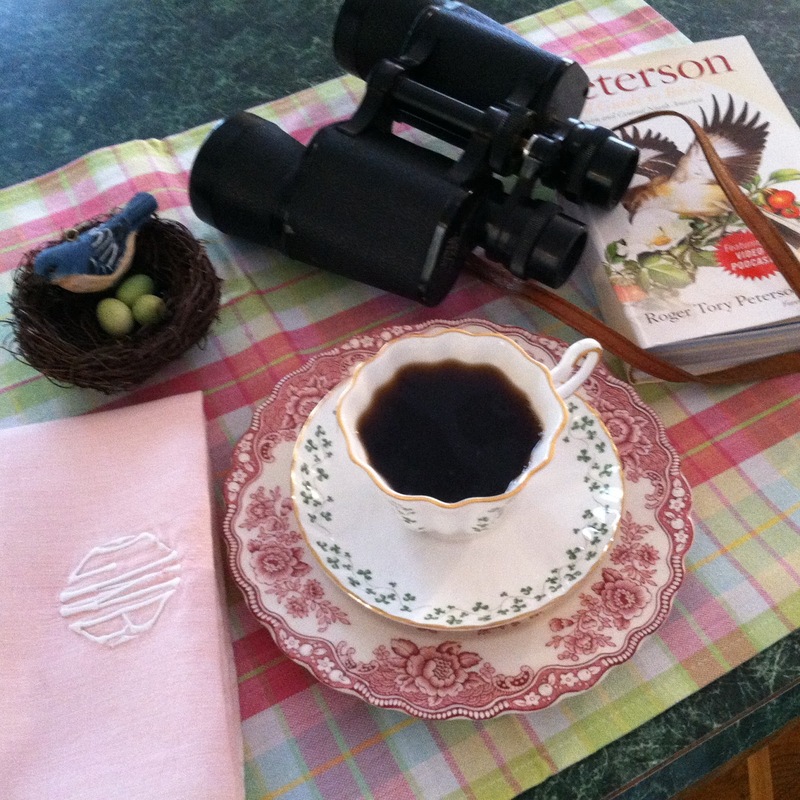 Won't you join us, as we have some tea and enjoy all things bird-related? I'm having my breakfast, and enjoying watching the birds outside my kitchen window. Despite all the snow on the ground, spring is in the air, most noticeably to me by the increase in singing and calling of the birds. They are thinking about "twitter-pating," if you remember the line from Bambi. 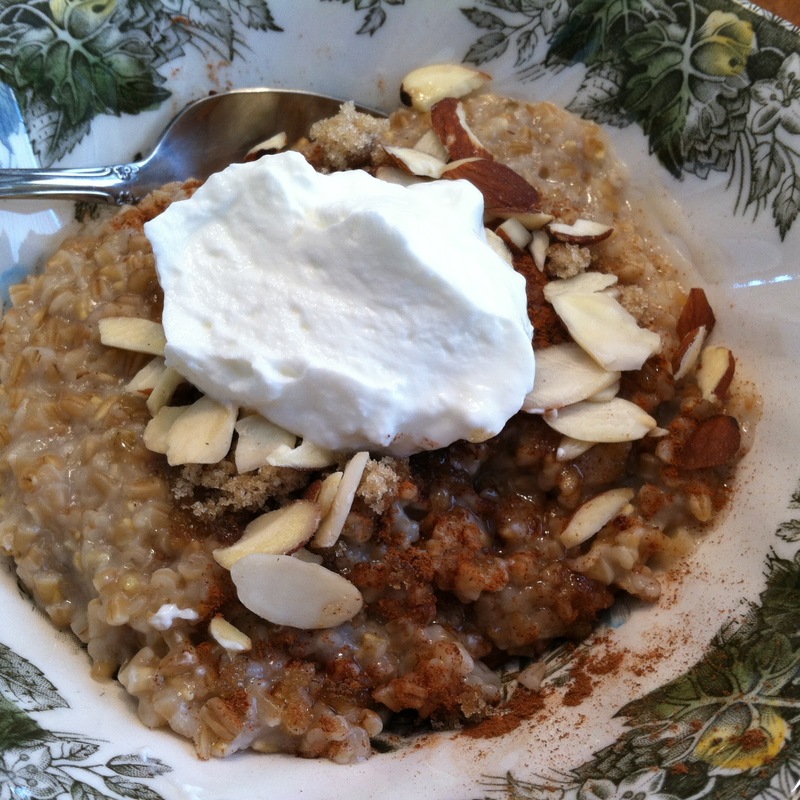 In honor of St. Patrick's Day, a hearty bowl of porridge (oatmeal) with a dollop of plain yogurt, and a sprinkling of brown sugar, cinnamon, and sliced almonds. Then I will sit with my morning joe (tea will come later, this afternoon), and enjoy the sights and sounds outside my kitchen window. I just got into birding last June, with the acquisition of a bird feeder. Previously, I could identify cardinals, blue jays, robins, and mourning doves. I called everything else lbb's (little brown birds). Now, five bird feeders later, and with the help of these . . .
. . . I am amazed at the variety of birds we have in our backyard. We back right up to a large wooded area, made up of mostly deciduous trees. There are a few evergreens, but not many, so that in the winter, everything is very brown. So easy for the birds to just blend in (except for the male cardinals, who stand out in beautiful stark relief). In the summer, I can hear varieties of different songs, but can't see much under the leafy cover. But from the vantage point of my kitchen island, where I have my morning coffee, I can now identify the birds as they come to the feeders: chickadees, juncos, titmice, nuthatches, house finches, sparrows, and downy and hairy woodpeckers, and in the summer, goldfinches and hummingbirds. I even saw a magnificent red-tailed hawk for about five seconds right on the deck railing outside my kitchen window. The only fly in the ointment is the squirrel, who parks himself in the cedar, and helps himself for a couple of hours on end. He used to run off whenever I yelled at him, but now he just looks at me with a ho-hum attitude, knowing that it's all bark and no bite. So I have taken to opening the sliding door and chasing him with a stick. It's kind of a love-hate relationship, as he is quite cute, and our cat loves to watch him. It's just that he doesn't just get a nut and leave. He plants himself down, kicks off his shoes, spreads out a napkin, and settles into packing away as much as he can. "Leave something for the others!" I yell out the window. "If you get sick, it's your own fault!" He just blinks and keeps eating. I've tried using the white safflower seeds, that are supposed to taste bitter to squirrels, but he has somehow developed a taste for them. Clearly, some intervention is called for. Three months of blogging? A celebration? Why not? I have been enjoying this journey immensely, and am grateful for the kindnesses of long-time bloggers who have welcomed me and left such encouraging comments. Thank you also to those who left me advice on blogging, and for answering some of my questions. Congratulations to Fabby of Fabby's Living for winning the teacup and tea towel . . .
Fabby always leaves enthusiastic and encouraging comments, and I think must be the type of person that makes everyone feel as if they are her best friend! She has gorgeous decorating taste as well! I will be contacting you, Fabby, for your address. Happy St. Patricks Day, Deborah! Love your shamrock teacup! That bowl of porridge looks delicious. Your squirrel and mine sound like they are related! Mine sits and just looks at me too. He is so bossy and bold and won't allow any other squirrels to eat the seeds off the ground with him. Yes, he parks himself there for hours and feeds off the seeds that the birdies drop from the feeder above. I always had one feeder in front of my window but this squirrel just took right over and wouldn't allow my birdies near it so we moved it to the clothesline where the birds can eat to their hearts' content. This squirrel is super cute and I think he knows it. 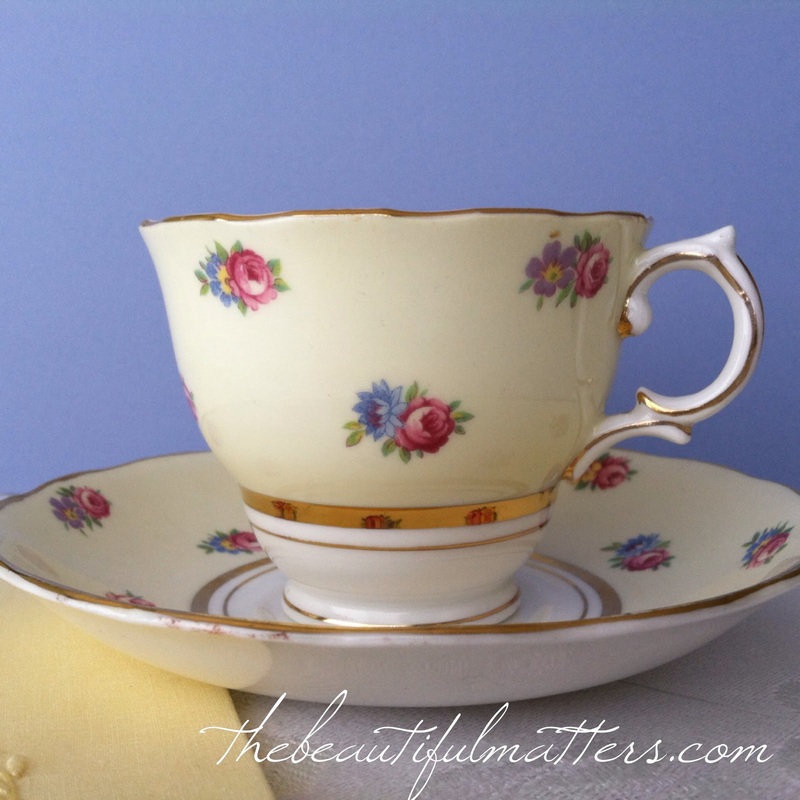 Thank you for sharing your lovely post with us and joining me for tea. And Congratulations to Fabby for winning your lovely Giveaway! thank you Rita! I have gone to the Cornell website to listen to some bird songs. I will check out the book suggestion. 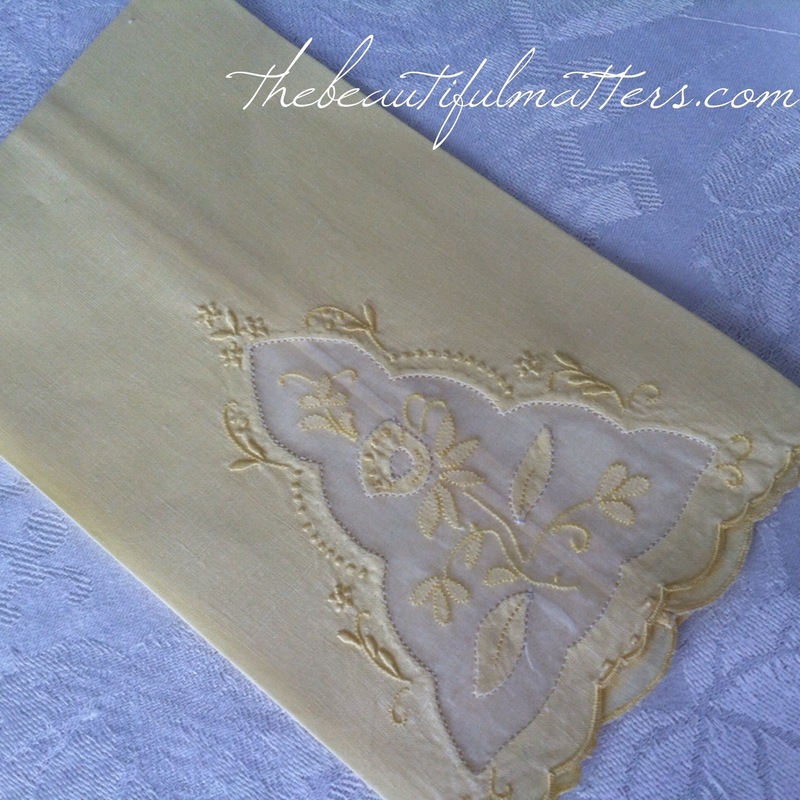 Such a lovely post Deborah! We get some beautiful little birdies too, and I never tire of watching them. I had to laugh about your description of the happy little squirrel making himself at home. I love the mix of greens with the reds that go all so well with the placemat they were set on! It was a joy to read about your bird-watching and struggles with that pesky squirrel. Your pictures are always so wonderfully staged. thank you, Carrie. That was actually a tea towel, but it matched so well I put it under the dishes. HAPPY ST. PATRICK'S DAY sweet Deborah...or should I say that I'm the one with "the luck of the Irish,"... just caz I pretended to be one with my Green and shamrocks tablescape, lol!!! OMG! WHAT A GORGEOUS TEACUP AND VINTAGE TOWEL, sweet lady, wow, I haven't won anything since 2012, what exciting news for a Monday!!!! Yupiii You are so generous to giveaway such a lovely gift just for a 3 months bliggiversary and here you look like at least it would be 1 year...you are a natural at it and a wonderful friend!!! Lots of thanks and I am very happy to have something from such a lovely blog friend in my house! OF COURSE I will mail to Ecuador!! It will be fun to think of the little tea cup traveling so far! So please do email me your address! 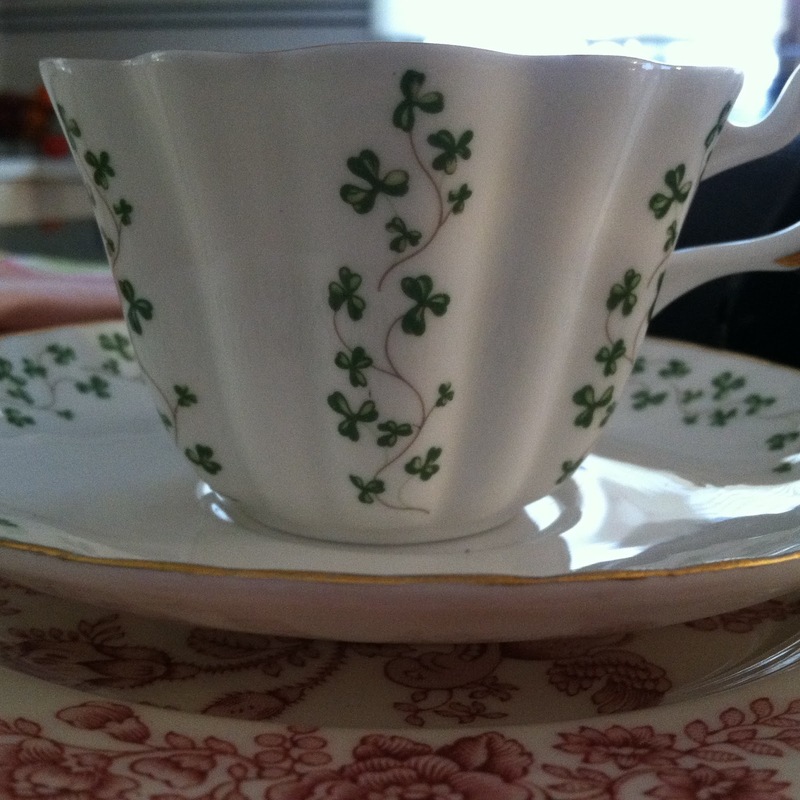 Oh I'd love to have breakfast with you in such a lovely setting, with the beautiful shamrock teacup, just perfect for this morning, that even St. Pat would have wanted to be at your table! I love how you paired the red transferware with the Green, gorgeous! Squirrels are such friendly Little guys, plus anyone would want to feel right at home with you, sweetie! Oh your breakfast looks so yummy! I would love that as a treat late at night too! Love your dainty Irish teacup. I love watching yardbirds too. I have to figure out how to feed them without inviting the fire ants. You must be the only other person besides myself that calls oatmeal, porridge. I grew up with it as the morning staple and when I ask others if they eat porridge, they don't have clue what I'm talking about. Your shamrock teacup is pretty and congrats to Fabby. I've been a bird watcher for a long time and have recently thought it's time to update my binoculars. Yippi ki yayyyyyy.....how exciting!!! Thank you so much sweet friend! PS: I will also let you know tomorrow a very cheap way you can send it. Thank you again and have a nice evening. I enjoyed your tea and another lovely Shamrock teacup. Never knew there were so many. I talked to hubby and he said it'll be: US Postal Service the best way and cheapest too. Thank you so much! Lovely breakfast and beautiful teacup. And it is so enjoyable to feed and watch the birds. Waiting for my spring ones to come visiting! I love your St. Patrick's Day breakfast and your gorgeous teacup. Yea for Fabby in winning the giveaway. She does leave the sweetest comments. Just getting a chance to visit. Love your pretty china! 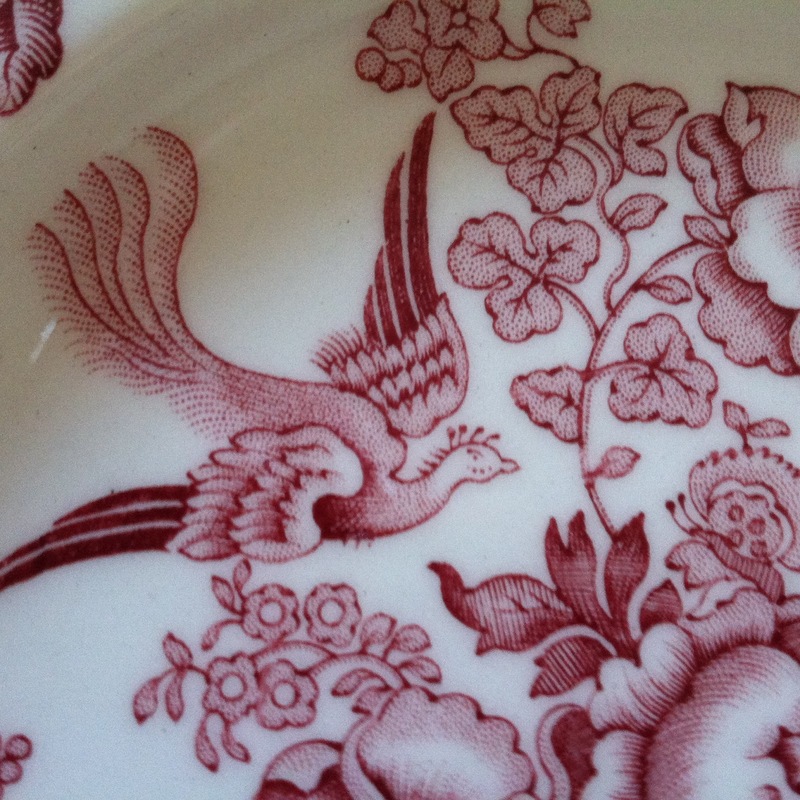 Last week I mentioned the fantasy birds on some Asiatic Pheasant china by Burleigh, and your Bristol is another variation of the old pattern...one of my favorites! Lovely...and gorgeous photos! Bird watching is a pleasure my husband & I love ! We have comfy chairs on our porch with a table in-between. 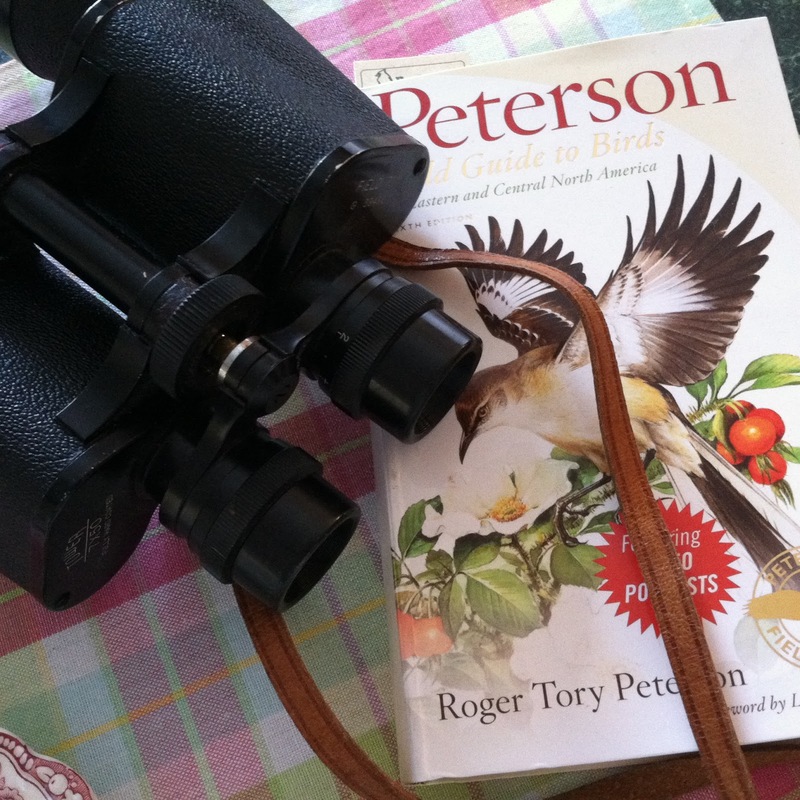 On the table we keep binoculars and bird books to view the 3 bird feeders we keep filled with sunflower seeds. We have our resident squirrels too and decided they are part of our porch entertainment. With 3 feeders the birds always have seed available. We have a squirrel who also kicks off his shoes and relaxes, chasing all birds away. I tried to chase him / her away a few times but was stared down , then ignored. The native squirrels around here have a tough enough time surviving and we decided they were worth the seed too. Oh what fun...I too love to watch the birds! My hubby gave me a book of birds that are native in our area and I always go to it for identifying birds at our feeders. Congrats to Fabby on her win, such a sweet lady and one that will surely treasure the sweet teacup and tea towel. thank you for the lovely comment today! your place is beautiful and I'm following. I enjoyed having tea with you today! I love to watch the birds and enjoyed seeing your treasures. Congrats to Fabby on her wonderful win. Squirrels....not crazy about them but do like to hear them chatter. Thanks for telling me it was here where I was confused -grin-, In my memory, I could see your hair, streaked with green, but couldn't remember WHERE! Too much on a mind that's not equipped to handle it all, I suppose -lol-. That gift if perfect for Fabby! Love your morning breakfast. I am laughing at your description of shaking a stick at the squirrel. Thanks for sharing your bird tea with SYC.